Ada pertanyaan untuk Railay Village Resort? 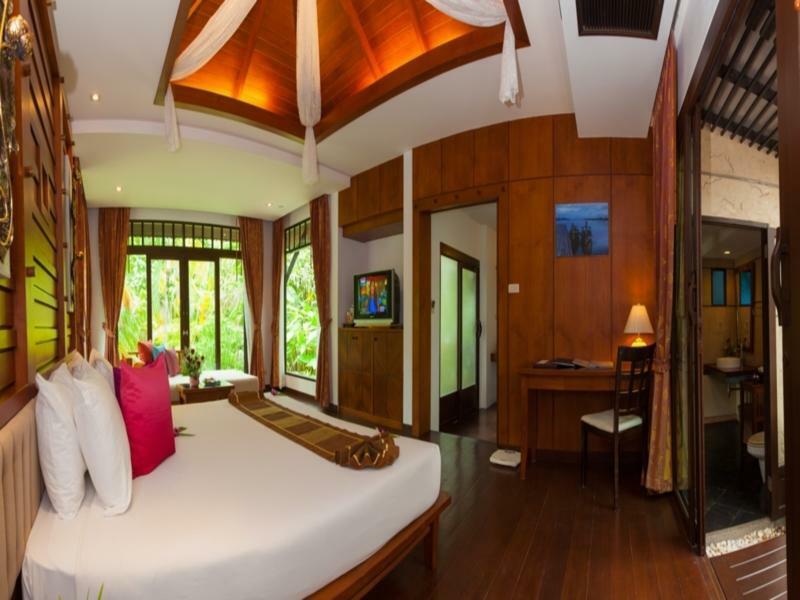 Jika apa yang Anda cari adalah hotel yang terletak strategis di Krabi, carilah Railay Village Resort. Hanya 14 km dari pusat kota, lokasi hotel yang strategis ini memastikan para tamu agar dapat secara cepat dan mudah mencapai ke tempat-tempat menarik. Dengan adanya obyek wisata utama kota ini seperti Pantai Railay, Real Rocks Climbing School & Shop, Pantai Phra Nang yang sangat dekat, pengunjung akan sangat menyukai lokasi hotel ini. Di Railay Village Resort, setiap upaya dilakukan untuk membuat tamu merasa nyaman. Dalam hal ini, hotel menyediakan pelayanan dan fasilitas yang terbaik. Hotel ini menawarkan sejumlah fasilitas di tempat untuk memuaskan segala jenis tamu. Nikmati fasilitas kamar berkualitas tinggi selama Anda menginap di sini. Beberapa kamar memiliki sandal, televisi layar datar, cermin, akses internet - WiFi, akses internet WiFi (gratis), yang disediakan untuk membantu Anda mengumpulkan tenaga kembali setelah lelah beraktivitas. Hotel ini menawarkan berbagai pengalaman hiburan unik seperti hot tub, kolam renang luar ruangan, pijat, kolam renang anak, taman. Apapun tujuan kunjungan Anda, Railay Village Resort adalah pilihan istimewa untuk menginap di Krabi. Tarif kamar pada 24 Desember 2019 dan 31 Desember 2019 sudah termasuk jamuan makan malam. Uang jaminan sebesar THB 2.000 wajib dibayarkan secara tunai saat check-in untuk biaya tambahan atau pengganti kerusakan selama menginap, dan akan dikembalikan saat check-out. Excellent place to stay, right in front of the beach. The hotel has a great pool area and watching the sunset was so great to appreciate. The staff was also super great and very kind. The only bad part is that there were so many mosquitos in the room. I got bitten several times. The staff brought more mosquito repellent for us but everyday there were mosquitos to but us. The location is amazing and the pool and landscape is outstanding!! We definitely would stay here again and wish we booked longer! My wife and I were traveling for our honeymoon and were extremely excited for this stop. It was the most expensive place we were staying, but figured it would be worth it. Pros: Beautiful rooms and setting. Service staff (housekeeping, restaurant, grounds) were very friendly. Cons: *Suite entrance, Bathroom, and jacuzzi DO NOT have AC. We were here in Feb but could not imagine being here during hot season. For the price, we would expect the whole suite to have AC. *Front desk staff were very unhelpful. Anytime we asked them for help, answers to questions or requests were just "no" as opposed to presenting any alternative options or trying to be accommodating. *Beach- while very scenic, the beach right in front of the hotel is where all of the longboats pull up and these LOUD boats are coming/going all day. I'm surprised they are not required to use the dock on the opposite side. It really puts a damper on an otherwise beautiful beach. Gorgeous little hotel in the heart of Railey Beach. You basically have a private beach! Room was clean, air conditioner worked, really nice view from the room. Restaurant was okay. Would be nice it they served cheese at breakfast, but otherwise, our stay was really wonderful. Nice, clean, spacious rooms. Great pools. Placed on the nice westside Beach. Perfect lokation. Rooms away from longtailboat noise. A bit more attention at the breakfastbuffet would be nice. Often lacked refilling. Noisy “airbubbles” in the pool. Made it a bit hard to enjoy staying on the balcony. Our stay was from January 25-30, 2019. I was hoping for the best, but because of mixed reviews I was prepared to be underwhelmed. Any apprehensions about choosing the wrong hotel were laid to rest the minute we arrived. We had a wonderful time and enjoyed our stay so much that we plan on returning in the very near future. Our room was on the second floor at the back of the property next to the larger pool. While I read complaints about staying at the back of the property we found our room to be perfectly located. It helped when we figured out that we can go out the back way too. The room décor is simple, but very attractive. Our only complaint is the lack/misuse of storage space. There was half a closet that we couldn't use because the opening is blocked by the vanity and the safe is in the half that you can get to. There are no dresser drawers. The grounds are beautiful and everyone on staff was helpful. 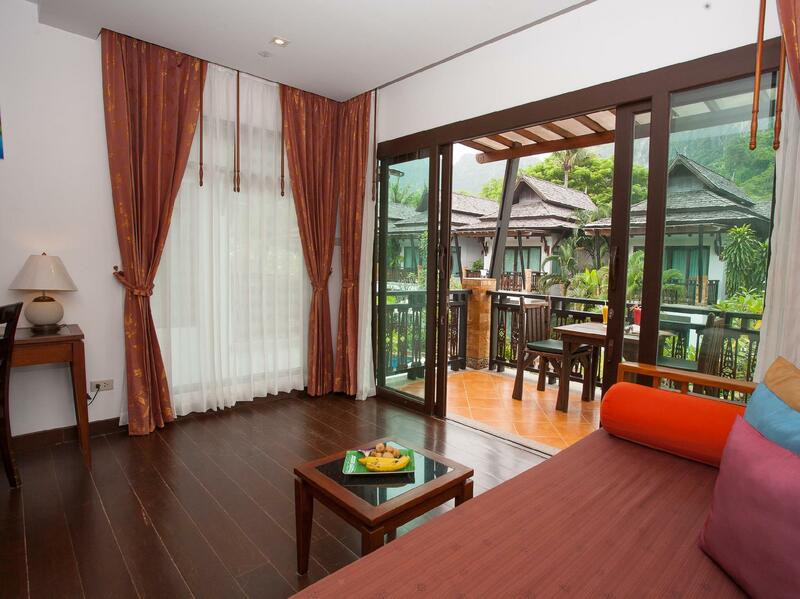 We're looking forward to returning to Railay Village Resort. We stayed at the deluxe rooms (next to the pool). Room is big. Bathroom is huge. Pool is nice. Lighting can be better (somewhat dim at night). It’s not super modern but everything was clean and of good quality. The best part was eating breakfast right on the beach. However, the breakfast food can be vastly improved - many hotels on Railay half the price of this one had better breakfast. Location is amazing - it is right next to west side of Walking Street, and you can access east side of walking street through a back gate. Came to celebrate our honeymoon and have arrived highly disappointed and dissatisfied. Rooms dirty and looking very poorly maintained. Pools and rooms not what they look like in the images and not adequate seating at the pool to cater for guests as well as many chairs being broken, meaning your literally lying on the floor. Blood was found on the floor and walls of the bathroom. Jacuzzi in room dirty with brown muck coming out of the jets. When asking reception to please send someone to clean it we were fronted with treatment like we were complete hassles. Beds very uncomfortable and solid as a rock. When asking things from reception we were fronted with difficulties where we were treated like nusiances. Breakfast was disgusting with flies and ants crawling all over the food. Would not recommend to stay at this resort nor will we ever again. If we had known railay east was within walking distance (5 minutes on concrete) we would have stayed there at a nicer resort. Beautiful and very luxury resort in an amazing place. Nice and friendly staff. If you think about booking trips around Railey, to the islands or back to Krabi / Ao Nang, you can probably better shop around a bit rather then book them at the hotel. They were overpriced. Other than that, I absolutely recommend coming here! Stunning views whilst enjoying breakfast. Best location for getting to everything as so central, next to the main walking street where all the bars and restaurants are but our room was blissfully quiet with stunning views as we requested an upper deluxe room. Really pleased with the service and ambience at this hotel. Great hotel and wonderful pool for children. Pool may not great for young children since supervision is always necessary. Rooms are big, beds are hard, so be ready for it. Lots of people so staff struggle to keep the place tidy, the attitude is great however. We enjoyed the stay. Last time I came to Railay beach it was 23yrs ago and there was no power after 6pm. And hardly anywhere to stay. I loved it then and loved it again. Obviously it’s much busier than it was but it still had a chilled feel and the surroundings are stunning. Sunsets amazing and the Railay Village reaper was perfect. Huge rooms, lovely restaurant, helpful staff and a little oasis in the midst of a lively little beach town. Highly recommend. Excellent place. Our room was clean with pool access right outside the door. It was also very close to the beach where we rented our longtail for island hopping. The staff was very helpful. They can help book your island hopping. But here's a tip. Double check a private kiosk on the beach where we were able to hire and haggle a private excursion for less than what a group tour would have been. It is astounding to find the breakfast provided by one of the best hotels in Railey to be so disappointing. The lack of variety and low quality buffet do not match the rating of this resort. Despite the scenic view, the 350 Bath per pax breakfast is not worth it. To make it worse, it is ridiculous that providing a single pillow and blanket is considered as an extra bed service, which by the way, costs 4000++ Bath per night. Both of my children were expected to sleep on the existing single sofa bed. The only thing that is good about this resort is its room and the landscape around it. Perfect location, great staff, amazing rooms, fabulous pool. 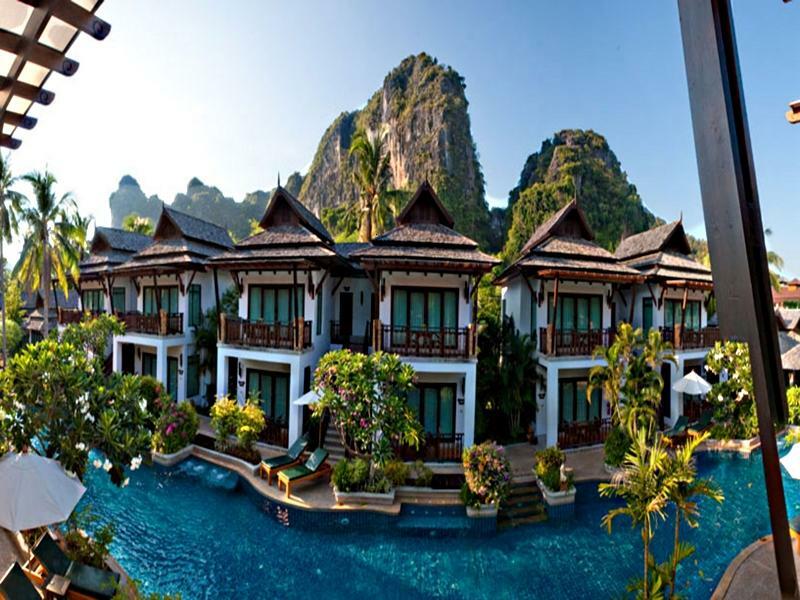 If you go to railay thats definetly the hotel you should book. The hotel is located on the west side, a minute walk from the goreous raily beach. The hotel gives a free basket of fruits everyday. The logistics of hotel airport transfers was prompt and very good. If you want a location in Krabi that is quiet, serene, far away from the crowds but still strategically located for island hopping, this is perfect. The room was also spacious and comfortable. I stayed here for 4 nights with my sister. We had a pool view room on the second floor. I would highly recommend these rooms, but particularly any ending with numbers 34, 35, 36, 37, 38. These rooms, whether they are 1034 (ground floor) or 2034 (2nd floor) are all on the right hand side of the pool and further away from walking street...so very quiet. The staff at reception are wonderfully friendly and attentive. The room was cleaned well. The breakfast was quite good, giving enough choice with pancakes, eggs anyway, fruit, hot dishes, juices and cereals. My only complaint about the whole experience would be the restaurant staff....They seemed disinterested in their job and occasionally rude. Having said that, the position, friendliness of the reception, quality of the room, the pools and facilities make it an excellent choice for Railay. I would certainly recommend. Unfortunately we booked late so the only room was the jacuzzi villa and we paid more than we really wanted to. However, we did not regret our decision as the location of this hotel is brilliant. It is literally right there when the ferry drops you off at Railay West depending on where you are coming from (we came from Koh Lanta and left to Phuket). Breakfast was standard -eggs, salad, cereals, fruit, toasts, beans, ham, sausage and pancakes. It doesn't seem to vary much but should cater for everyone's tastes. Decent check-out time of 12pm. We loved Railay and wish we could have stayed longer.